The PM-2 makes a strong statement: Fender is serious about acoustics and it’s reaping rewards for us players. A bigger and bolder voice than you might expect from a parlor-style guitar. The neck weight on the strap might not please some. Fender’s specs say otherwise, but the PM-2 parlor’s neck feels meatier when compared to the recently-released PM-1 and PM-3 from this range, especially in comparison to its slimmer body, and there’s more of a medium-low action here compared with the low on the other models. Off-putting for some, but it could also be a key factor towards this being the biggest surprise of the trio. It certainly makes its extra 2mm depth over the PM-3C count. We’re used to the descriptions ‘boxy’ and ‘compression’ being par for the parlor experience, but the PM-2 projects the latter trait wider than expected with more lower-end clout than you might assume from looks alone. The solid construction surely helps and the PM-2 soon reveals a versatility that could appeal to those who may not have considered a small-body model before. 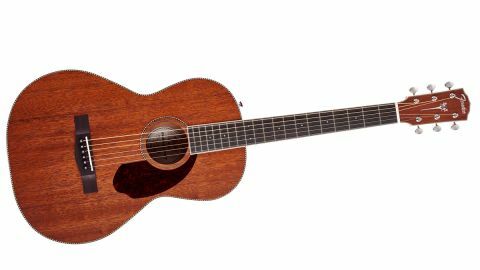 Again, that rounded woodiness pervades picked notes, but it really opens up for harder strumming – richer and more powerful in the bottom end where it might be expected to be predominantly mid-focused.